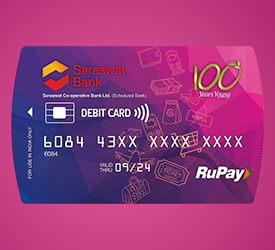 Rupay Contactless Debit Card - Saraswat Cooperative Bank Ltd.
Saraswat Bank’s Rupay Contactless Debit Card provides convenience of contactless payment along with the existing features offered on Rupay Debit card. A Contactless debit card is a faster way to pay with your debit card for purchases under Rs.2000/- at stores. Instead of dipping (or swiping) your card on the merchant terminal, simply wave or tap your card on the contactless enabled terminal and pay without entering a PIN (for amount upto Rs.2000/-). Saraswat Bank’s Rupay Contactless Debit Card is based on latest safe & secured technology. It will help you spend less time at the payment counter and empower you to do the things in few seconds! Rupay Contactless Debit Cards are secured like any other Rupay chip cards. They carry the same multiple layers of security, which ensures that you are safe from fraudulent or unauthorised transactions. Since your Rupay Contactless Debit Card stays in your hand only, you remain in control of your card at all times. Saraswat Bank’s Rupay Contactless Debit Cards supports online (contact & contactless) & off-line (contactless) transactions. Rupay Contactless Debit Cards card can be used at ATMs, Merchant establishments & online (e-commerce) payments in addition to other areas of contactless payments viz., Toll, parking & other small value merchant payments where contactless enabled terminals are installed within India only.